You could be cruising on flat calm water, running rapids on a white water river, heading out to sea in a sea kayak, playing canoe polo in a swimming pool, catching fish from your customised fishing kayak, playing in the surf in a surf kayak, sprint racing at the Olympics, doing the classic Devizes to Westminster 125mile race or any number of other activities and you would still be kayaking. What is your type of Kayaking? 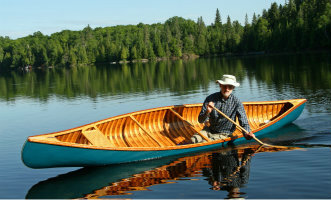 The fact that all kayak paddlers will want to move their kayak forwards mean that they all need the same basic forward paddling technique. There will be some subtle differences but learn the basics and you can easily adapt to other types of craft. In order to ensure that your life is as easy as possible you will want to be sitting in the right kayak with the right paddle doing good basic forward paddle strokes. This will hold true whether you want to go as fast as possible because you are racing or whether you want to enjoy going a bit further than you otherwise would have the energy for because you are loving the outdoors. It will also hold true if you are paddling down a rapid and need the power to do a big cross or trying to catch that wave. A good forward padding stroke will give you the power and speed to make the cross or catch the wave. Check you know the basics with our page on the basic forward paddling stroke before you develop the more sophisticated skills required of your chosen activity. Paddle choice is important for all paddlers and some basic principles apply. Longer paddles work well with longer boats that glide and shorter paddles suit shorter boats that need to be kept moving and not lose momentum. Bigger paddlers need bigger blades to develop power whilst lighter smaller paddlers need smaller blades to ensure they can get to a suitable rate. 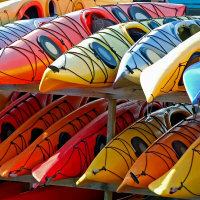 Take a look at our page on kayak paddles and we will delve into the art of choosing the right paddle. Waves are waves are waves... well nearly, some are bigger than others and sea waves are a bit different to river waves but there are some basic concepts that will help you understand how to paddle when the river or the lake or the sea isn't flat. 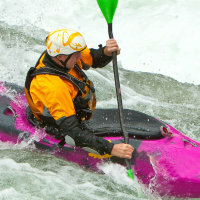 Read about the basics of white water paddling whatever you plan on doing. If white water is for you go on and learn more. Wash-hanging - the marathon racers have made an art out of sitting on each others washes for an easy ride and then manoeuvring around at the critical moment to get to the front. Learn some of their tricks and you will be able to help the weaker member of your group keep up on your next leisurely tour or take turns at the front of your group to make sure you get home before the sun goes down when you've stayed out a bit longer than you planned. Our competitive sprinters and marathon paddlers and their coaches have invested huge amounts of time and effort working out how to make a boat go as fast as possible using just the human body as an engine. 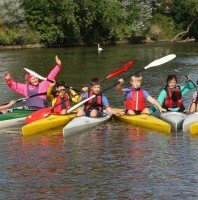 What they have learnt can benefit all paddlers be it technique, nutrition, training methods etc. You don't need to become as expert as they are but a little of their "how to go fast" and "how to keep going fast for long periods of time" magic just might make your long sea trip a little easier and more enjoyable or help you develop the speed to catch that surf wave. Then we have the white water kayakers who just love to play on waves and rapids and the White Water racers who spend their days finding the fastest route down a rocky river. When the marathon paddler turns up to race and finds the river has risen overnight and is running fast or when the wind is howling down the regatta course and the sprinter is in his or her ultra fast (but unstable) kayak they will really appreciate having learnt a little more than their competitors about support strokes and reading waves, ferry gliding and surfing a following wave. There are plenty of other situations where one area can learn from another but most of all as the sayings go "variety is the spice of life" and "a change is as good as a rest" so we urge you to try something new every once in a while.